Nvidia's just kicked off Game24 , a 24-hour, multi-city livestream event that they've labeled a "PC gaming holiday." I'm in attendance at Hangar 8 in Santa Monica, California for the start of broadcast. 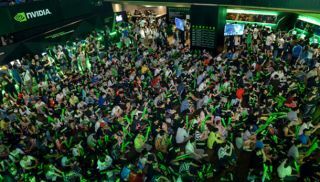 Nvidia's promised a bunch of pre-recorded and live programming meant to inspire appreciation of the PC as a platform, including a 24-hour system modding competition , tournaments, giveaways, and interviews from participating developers like 2K, Boss Key, Epic, NCSoft, Blizzard, Wargaming, WB, Sony Online, Deep Silver, and more. It's a rare instance of a company involved with PC gaming stepping up to produce something that promotes the PC itself as a platform, and I'm interested to see how it's received. Check Nvidia's Game24 page for more details.